Summer won’t be with us for a while, but that’s not an excuse to be lazy. On the contrary, now is the best time to start a new life in the New Year and get fit. And for those who need extra motivation, here is a perfect example! Though otters sometimes look really sweet, they are predators that Brazil's local tribes even call "aquatic jaguars." In the video below, a giant otter successfully confronts two jaguars that approached the water to quench their thirst. A cute otter raised by humans rather than its own parents is capturing the hearts of internet users by storm, gaining thousands of followers on social media. This awesome sea otter, a resident of the Oregon Zoo, was trained to play basketball. It helps the animal to keep fit and helps ease the aging animal's arthritis. Otters were never so sweet before. Rory MacPherson from Scotland noticed an otter in the road and decided to snap a video of it. He never suspected this innocent attempt would turn into an epic otter chase! The aggressive mammal bit man’s shoes and forced him back into his car. 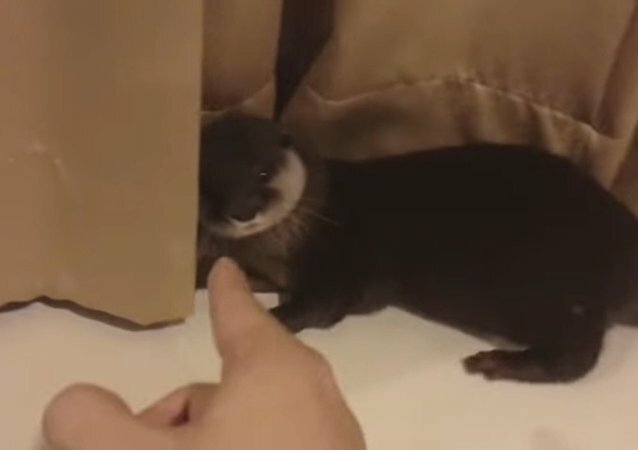 Meet Popo, an adorable pet otter who really likes her owner's attention. Take a cute photo of a happy otter. Mix in an unrestrained imagination and season with a “drop” of basic Photoshop skills. Your good mood should now be ready. Serve hot online. This adorable trio will melt your heart. Two cute baby otters are drinking milk and squeaking. Don’t miss out! Have you ever seen an otter on the hunt? If not, check this out. When you are upset or feeling bad, just take a bath with an otter.